Derry desperately needs a dose of the Dungloe effect because in 2014 multinational health products company Randox announced it was generating 500-plus high-end properly paid jobs in this attractive little Donegal town. Th health products developed in Dungloe by the company’s scientists and technicians include help with Alzheimer’s, kidney disease and cancer conditions. So, if this can happen in Dungloe then Derry too can be a successful location for foreign manufacturing companies from US, Japan or Switzerland, to give just a few examples. So it’s up to Derry’s seven elected members – five MLAs, Elisha McCallion MP and Derry-based MEP Martina Anderson – to exert maximum pressure on Invest NI to get the next big health products company coming from overseas to anchor in Derry. Unlike Belfast, Dublin and Cork, Derry the fourth largest city in Ireland, has no health products manufacturing industry. The seven will only of course be doing what they promised when electioneering – working to help get properly paid jobs into Derry. The seven members must not listen to some local reports and commentators who have been busy recently in the local papers and on radio giving pure Hans Christian Anderson reasons for Derry being industrially disadvantaged. The effects of no available properly qualified workforce is one reason given. Nonsense. yet one of the world’s most sophisticated health care product plants is located there. For the simple reason rich companies like Randox Dungloe recruit worldwide for key scientific talent and pay top-dollar salaries. When you add cheap housing and an Atlantic location, what scientists wouldn’t want to locate with their family to Dungloe? So let’s say a big health products manufacturing company – generating 200 to 400 jobs – is coming to Derry as a result of the seven members exerting maximum political power on Invest NI this company too would successfully recruit key scientific staff internationally. Cheap Derry housing, the Atlantic coast 30-minutes away and cheap holiday homes will also be a big factor in making Derry an attractive location for the key scientific talent and the family members. If Dungloe can do it so can Derry. The June deadline is fast approaching, when the dithering British government have to put forward their solution in the Brexit negotiations for the illegal border dividing our country and people. The harsh reality is, that they don’t have a clue. We have had to listen to the Brexiteers with their bespoke solutions, technical wizardry and bluster. The Tory government are in disarray and denial of the issues regarding the border. There is no evidence to suggest there is currently a technical solution that would avoid infrastructure at the illegal border. I applaud our friends in Brussels for standing up to the Tories and their recent bedfellows the DUP and bluntly telling them that there would be no deal on their exit, without a solution that keeps the occupied part of Ireland in the Single Market and the Customs Union. Michel Barnier is proving to be an honest broker, a realist, a man of integrity and a true friend of Ireland in this crucial time in our troubled history with the brutal British Empire. For unionists the issues at stake are purely symbolic, what Mr Barnier is proposing makes them less British, and obviously more Irish (tough, too bad...). The DUP will again have a tantrum and throw their toys out of the pram, but among them are some who will not want to bring down the Tory government and risk putting another loyal friend of Ireland, Mr Corbyn, into No 10. Mrs May and Mrs Foster are now trapped by bad options. A poll conducted by LBC shows that two thirds of Brexiteers thought that leaving the EU was much more important than holding on to their band of flag-waving, loyalist dinosaurs in the north of Ireland. We are now entering the end game where the DUP will be sold out faster than turkeys at Christmas by their Tory friends. A border in the Irish Sea is the obvious solution to the current impasse, followed by a border poll and the reunification of our country and its people. The BBC and the printed media continue to call the border in Ireland the Irish border – it is no such thing. No country would or did ever willingly put a border in their own country. 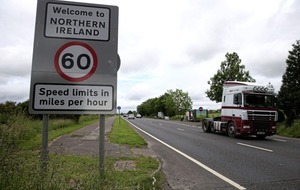 The border here is a British imposed and maintained border by threats of force – no ifs or buts a British border and until it is removed there will never be real peace in Ireland. To prove my point the British imposed many borders worldwide in their empire days, which to this day are the cause of death and regional instability. They actually imposed two borders in India leaving a no man’s land in the middle and the most well-documented one still causing regional unrest is the border they imposed by force [as all borders were] in Palestine. This border came about to facilitate the British putting a country inside someone else’s country, which Churchill actually called our little Ulster in the Middle East. 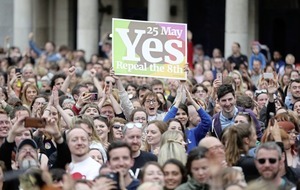 I appeal to the people of Ireland, both men and women, who are about to vote on the Eighth Amendment, to reflect on this most serious referendum. By voting to repeal the Eighth Amendment this could open the door to abortion on demand. Life begins at conception. Although very tiny, the unborn baby is also a human being and its right to life should have some protection. To have unrestricted access to abortion in the first 12 weeks of pregnancy would be an infringement to the rights of the unborn child. The Irish people have the freedom to choose but it should be an informed decision to do the right thing for the mother, the baby and the whole family. 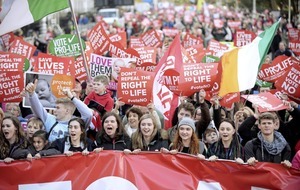 The Eighth Amendment “acknowledges the right to life of the unborn and, with due regard to the equal right to life of the mother, guarantees in its laws to respect, and as far as practicable, by its laws to defend and vindicate that right”. It speaks in terms of respect, rights and equality. It does not state that one right is more important than the other. Of course, if the mother’s life is at risk she should be allowed access to abortion. This right already exists, so repeal of the Eighth Amendment is not necessary to allow this. Cavaliers In Need NI would like to thank the kindness and generosity of the people of Belfast on Sunday May 7. We raised a fabulous £1,106.93.